A Cairo misdemeanour court sentenced in absentia on Tuesday three Strong Egypt Party members to three years in prison and an LE500 fine for hanging posters calling for a 'No' vote on the now-passed 2012 amended constitution. Charged with disturbing public peace and distributing flyers, the party members were arrested early January while handing out leaflets calling for a 'No' vote ahead of the constitution referendum held on 14-15 January. Strong Egypt Party Spokesman Ahmed Emam told Ahram Online that the verdict is against freedom of expression and contradicts liberties granted by the passed constitution. Emam added that current Egyptian authorities are heading in the same unchanging direction as their predecessors. He added the party has been facing a harsh campaign against it because it opposes some of the government's policies. Strong Egypt supported the 30 June demonstrations against Brotherhood rule but criticised the ouster of Mohamed Morsi on 3 July calling it a "coup." Tuesday's verdict, Emam added, actually proves the party's claims of a government crackdown against all opposition to be correct. Strong Egypt will respond to the verdict with political and media escalation, the measures of which will be determined once the party examines the text of the court verdict, Emam said. Although it had initially called for a 'No' vote -- citing that the constitution does not fulfil the goals of the January 25 revolution and renders the military a "state above the state" -- the Strong Egypt Party boycotted the constitution referendum following its members' arrests. A majority of 98.1 percent of Egyptians said 'Yes' to the constitution, with a turnout rate of 38.6 percent. Abdel-Moneim Abul-Fotouh, Strong Egypt Party head and a presidential contender in Egypt's 2012 presidential elections, said he won't run for Egypt's upcoming presidency to protest the arrest of his party members. 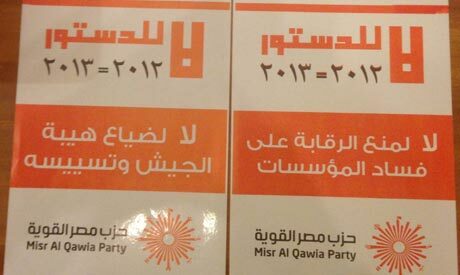 The party will also boycott the upcoming presidential elections. IF any politician thinks that coming election will be free not marred one.he is day dreaming. Hadains Sabahi and other presidental candidates will be JUST EXTRAS The Hero will win in order to save Egypt from the WICKED ones. If it was illegal to campaign for a no vote on the constitution, then the presidential election may be a shame dictatorial one as well. Need to have free and fair elections, not Mubarak style ones. what kind of democracy is this? you were not opposition then why election? go on out of middle east see what is democracy. even somalia has some of democracy. god bless egyption. well don temarod. hail sisi's democracy. If you think that the US is ruled democracy then you are wrong. Obama and before him Bush were just puppets.